I’ve been so busy these last couple of months, I’ve neglected my blog quite a bit and I’m sorry about that. My intention was to do a review of Charlotte’s Web by E.B. White, another of my favorite childhood books, but I came across another book I enjoyed so much, I’m letting it cut in line and take over for a bit. Originally titled, Small Change for Stuart in the 2011 U.K. publication, the U.S. version, published in 2012, kept the cover but re-titled the book, Horten’s Miraculous Mechanisms. The author is Lissa Evans and she has published books for adults and younger children but this is her first foray into children’s lit. Stuart is a 10 year old boy who is, not only small for his age, but if you take his name, Stuart Horten, and use the first initial of his first name in conjunction with his last name, you get S. Horten…shorten…something Stuart is not too fond of. In addition to his short stature, his parents are tall, intelligent, and keen on moving to a small village after his mother gets a new job hundreds of miles from where Stuart and his family currently live. It just so happens that the village of Beeton, where Stuart’s mom will be working, is the village where Stuart’s dad was born. 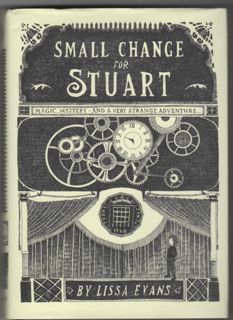 Stuart’s strange adventure is about to begin and I think your children, ages 8-11, would love to go with him. Parents might enjoy the trip too. The book is a quick read and an easy one that could be read aloud before bedtime with no fear of bad dreams. It sort of reminded me of Encyclopedia Brown, which I loved. It’s the type of kid mystery that got my imagination revved up and determined to solve mysteries. I think everyone in your family will quickly become fans of Stuart and I wouldn’t be surprised if this book ended up on the big screen sometime in the near future. Currently, a copy of the book on the left, Small Change for Horten, published by Doubleday in 2011, first edition, first printing, hardcover with fine dust jacket is fine condition is selling for $75.00 and up. I did see some copies up for bid on E-bay with a starting bid of about $20.00 but I think they’re going to go pretty fast due to the fact that the original U.K. publication is getting more difficult to find. The most expensive price I saw for this version was $127.00. I estimate if the movie rights are sold, this particular edition will easily go up in value. A copy of the U.S., 2012, publication by Sterling, Horten’s Miraculous Mechanism, is selling right now for $5.00 up to about $13.00 from a variety of book stores, including my bookstore, The Literary Heart. 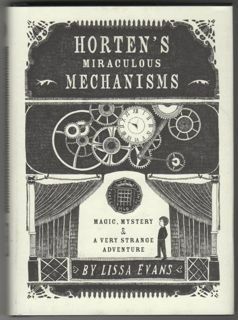 The author, Lissa Evans, is currently writing a follow-up entitled Horten’s Incredible Illusions and it’s due out in September 2012. It is available for pre-order in the U.S. and the U.K. on a variety of sites.